1/2 x 2'' Fluted Dowel PinsSold in lots of 100. As low as $3.20 per lot. ..
1/2 x 2'' Spiral Dowel PinsSold in lots of 100. As low as $3.00 per lot. ..
1/2 x 3'' Fluted Dowel PinsSold in lots of 100. As low as $4.50 per lot. 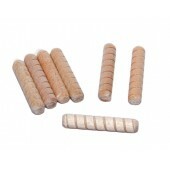 ..
1/2 x 3'' Spiral Dowel PinsSold in lots of 100. As low as $4.30 per lot. ..
1/2 x 4'' Fluted Dowel Pins Sold in lots of 100. As low as $6.40 per lot. ..
1/2 x 4'' Spiral Dowel PinsSold in lots of 100. As low as $6.20 per lot. ..
1/4 x 1'' Fluted Dowel PinsSold in lots of 100. As low as $1.00 per lot. ..
1/4 x 1-1/2'' Fluted Dowel PinsSold in lots of 100. As low as $1.25 per lot. ..
1/4 x 1-1/4'' Spiral Dowel PinsSold in lots of 100. As low as $1.025 per lot. 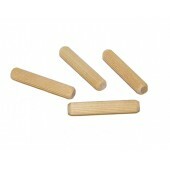 ..
1/4 x 2'' Fluted Dowel Pins Sold in lots of 100. As low as $1.55 per lot. ..
3/8 x 1-1/2'' Fluted Dowel PinsSold in lots of 100. As low as $1.45 per lot. ..
3/8 x 1-1/2'' Spiral Dowel PinsSold in lots of 100. As low as $1.475 per lot. ..
3/8 x 2'' Fluted Dowel PinsSold in lots of 100. As low as $1.70 per lot. ..
3/8 x 2'' Spiral Dowel PinsSold in lots of 100. As low as $1.80 per lot. ..
5/16 x 1-1/2'' Spiral Dowel PinsSold in lots of 100. As low as $1.26 per lot. ..